現在の版 2019年2月15日 (金) 17:53 960 × 600 (58キロバイト) FDRMRZUSA Optimized: reduced svg code. No other changes. 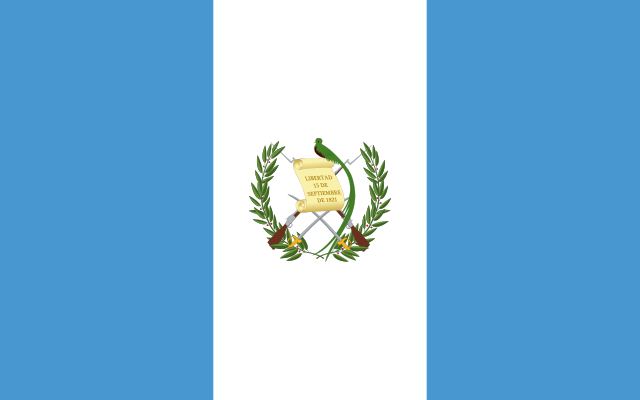 2012年11月16日 (金) 17:01 4,394 × 2,746 (174キロバイト) Edgouno Matching with the new "Coat of arms of Guatemala.svg"
2011年8月31日 (水) 03:07 560 × 350 (221キロバイト) Edgouno Coat matched with the new Image:Coat of arms of Guatemala.svg. 2011年8月30日 (火) 23:32 560 × 350 (144キロバイト) Edgouno Reverted to version as of 02:03, 18 August 2011 - The inscription can't be readed without the border. It doesn't have contrast. 2011年8月18日 (木) 02:03 560 × 350 (144キロバイト) Edgouno Matching blue colour with ISCC-NBC 177 as described on the official decree. 2011年8月14日 (日) 05:05 560 × 350 (144キロバイト) Edgouno Changing light blue to gray.